I know, I know, I wasn’t going to post this week. I was going to ensconce myself in my Chamber of Clandestine Composition and work until my fingers bled (and believe me, that’s what I’ve been doing). However, I have news so exciting it couldn’t wait. I had to bust out and tell you (also: get myself a cup of tea. Composing clandestinely is thirsty work!). It’s the new cover, darlings. Here it is! When you see it in shops, it will have the Morris sticker on it too! So it turns out, ha ha, the new edition is coming out earlier than anticipated (in the US, anyway) because shops are running out of the older edition. These have already shipped, and shops will be putting them out soon. If you dearly love the original cover (and I do, so I understand that), your time to find those may be limited. I merely mention the fact. I don’t know what the schedule is for the changeover in Canada. I do know that Canada is planning to re-jacket on the original book; the bonus material will be available online from Random House Canada (link provided on the jacket flap). Once those all sell, the next printing will have the bonus material inside. When I learn any more details, I’ll let you know. So there you have it, bright and festive, new but not unrecognizably so. I like it a lot, particularly the new font, and that S that looks like a little dragon in its own right. All right! Back to work with me! You can’t tell from the scan, but there’s a touch of iridescence to the lettering as well. It’s very pretty. I love it! I love the old one too…but this is just lovely. I find myself particularly liking the warmth of the town, as if we’re seeing it at sunset or something. 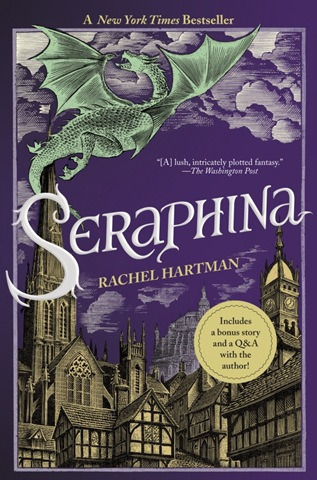 While I am sad to hear stores are running out of the older edition (its cover is downright gorgeous), I have to agree about the S, and I’m adoring the purple background. But: “Includes a bonus story”?! Wouldn’t happen to be The Audition, would it? It is The Audition, yes. And that’s available online for people who bought the original edition. Could you repost a link to the story? I’m *thrilled* to hear that stores are running out of the original edition on principle. New cover/printings = sales. On the other hand, as nice as this cover is, the one on earlier printings still feels like the “real” one to me. We should all have such dilemmas. Congratulations! Ahhh! Finding this edition is nearly impossible. Personally I prefer this one to the other one, hence why I’m looking for it, but it seems that all of the online bookstores are selling the old one. Is there anywhere I can purchase this edition instead? Uh… I think you may have the covers reversed? As far as I know, this purple cover is the one that’s widely available. It’s the one they used for the paperback, after all. If you’re looking for the original cover, maroon and cream, same artwork but more obviously a wood-block print, I know that Powell’s in Portland OR still had copies when I was there in Feb. Unless you’re not in North America, of course. Forgive me for assuming that. The UK paperback has that wood-block print cover, iirc. If you prefer the purple one, you may have to order it from overseas.